South Korea wins double gold in taekwondo – first in the women’s 57 kg, then in the men’s 68 kg. Lim Sujeong of South Korea defeated Su Li-Wen of Chinese Taipei in the preliminary match by a score of 1-0. In the quarterfinals, she defeated Robin Cheong of New Zealand with a final score of 4-1. In the semifinals, she sent Veronica Calabrese of Italy to the bronze medal match winning with a score of 5-1. In the finals, she won by a score of 1-0 to take the gold medal leaving silver for Turkey’s Azize Tanrikulu. The bronze medal winners are Diana Lopez of the U.S.A. (who defeated Italy’s Calabrese in sudden death overtime) and Martina Zubcic of Croatia (who defeated Chinese Taipei’s Su Li-Wen in sudden death overtime). In the men’s 68 kg, South Korea’s Son Taejin defeated Dennis Bekkers of the Netherlands in the preliminary match by a score of 4-3. In the quarterfinals, he defeated Turkey’s Servet Tazegul with a score of 1-0. In the semifinals, he won by a score of 7-6 sending Chinese Taipei’s Sung Yu-Chi to the bronze medal match. In the finals, he took the gold medal with a score of 3-2 leaving Mark Lopez of the U.S.A. with a silver medal. The bronze medal winners are Turkey’s Tazegul (who defeated Peter Lopez of Peru – not related to Mark Lopez and family) and Chinese Taipei’s Sung Yu-Chi (who defeated Germany’s Daniel Manz). China’s Wu Jingyu defeats Thailand’s Buttree Puedpong capturing the gold medal in the women’s 49 kg and leaving Puedpong with a silver medal. The score was 1-(-1). Thailand’s Puedpong’s fight record in the contest was 1-0 over Cuba (won in overtime), 2-1 over Vietnam (won in overtime), and a win by superiority over Venezuela (the score was 2-2). China’s Wu’s fight record in the contest was 7-0 over Kenya, 8-1 over Sweden, and 4-1 over Chinese Taipei. Based on contest history, it looked like Wu was the dominant competitor going in. Puedpong gave Wu a run for the gold though, but unfortunately Puedpong couldn’t land a solid back kick on Wu. Bronze medals went to Venezuela’s Dalia Contreras Rivero and Cuba’s Daynellis Montejo. Cuba’s Daynellis Montejo, having lost the preliminary match to Thailand’s Puedpong, surprised the audience and taekwondo fans by defeating Chinese Taipei’s Yang Shu-Chun, who was defeated in the semi-finals by China’s Wu. Montejo won the bronze 3-2 in overtime. In the men’s 58 kg, Mexico’s Guillermo Perez won over Dominican Republic’s Yulis Gabriel Mercedes by superiority (the score was 1-1). In taekwondo, if a tie remains after sudden death overtime, the winner is determined by the Rule of Superiority. The more aggressive competitor is considered to be superior. The judges and the referee determined it was Perez who was superior in this match leaving Mercedes with a silver. Dominican Republic’s Mercedes’ fight record in the contest was 3-0 over Portugal, 3-2 over Chinese Taipei, and 3-2 over Spain (won in overtime). Mexico’s Perez’ fight record in the contest was 3-2 over Great Britain (won in overtime), 2-1 over Afghanistan, and 3-1 over Thailand. Bronze medals went to Afghanistan’s Rohullah Nikpai and Chinese Taipei’s Chu Mu-Yen in the men’s 58 kg. After losing the quarterfinals to Mexico’s Perez, Afghanistan’s Nikpai first defeated Great Britain’s Michael Harvey in the repechage round. (Harvey lost the preliminary match against Mexico’s Perez.) Nikpai went on to the bronze medal match defeating Spain’s Juan Antonio Ramos, who lost in the semifinal match to Dominican Republic’s Mercedes. Nikpai won the bronze by a score of 4-1. Chinese Taipei’s Chu lost the quarterfinal match to Dominican Republic’s Perez, then went on to defeat Portugal’s Pedro Povoa in the repechage round. (Pedro Povoa was defeated in the preliminary match by Perez.) In the bronze medal match, Chu defeated Thailand’s Chutchawal Khawlaor, who lost the semifinals to Mexico’s Perez. Chu won the bronze by a score of 4-2. Check with www.cbc.ca/olympics/ Thursday night to see Canada’s next two matches in taekwondo, Karine Sergerie in the women’s 67 kg and Sebastien Michaud in the men’s 80 kg. Carol Huynh has won Canada’s first Olympic gold medal in women’s freestyle wrestling. Competing in the 48 kg weight division, Huynh easily defeated her Japanese opponent by getting four points in the first period and two in the second. Additionally, teammate Tonya Verbeek won her bronze medal match in the 55 kg weight class for freestyle wrestling getting Canada’s first bronze in this year’s Olympics. I’m still holding out for some good taekwondo matches in three more days. CBC promises to air all of Canada’s taekwondo matches. Sports Illustrated has predicted medals for all three of Canada’s competitors in taekwondo. Don’t forget to tune into CBC Tuesday night at 9! Canada has yet to win any medals in the Olympics this year. Perhaps Canada’s best chance for a gold is in taekwondo. Okay, maybe I’m a little biased (I’ve only been training in taekwondo for almost nine years), but let’s look at Canada’s women’s lightweight contender – Karine Sergerie. Sergerie is the current World Taekwondo Champion in her weight division (she weighs in at 63 kg). Prior to her gold win in the 2007 World’s, she placed second in 2003 and third in the 2005 World’s. On top of that she won the gold medals in the 2007 and 2006 Pan-Am Games. In 2006, she won the Commonwealth Taekwondo Championships. She has won the gold in the Canadian Senior National Championships since 2002 – that’s a seven-time consecutive champion in Canadian Nationals. That’s an amazing record so far, almost enough to win the olympic gold medal on its own. Sergerie apparently isn’t the type to let her record stand on its own, but rather the type that will keep battling it out. Here’s a video clip of her winning the 2007 World’s. In this match she was down 3-0, she pushes on in the match to tie and move it into sudden death overtime. (In taekwondo rules, you could also lose a point if you get two warnings from the referee and lose the match in sudden death that way too.) She manages to get her kick in faster and stronger than her opponent and win the gold. Canada has two other athletes in the olympics for taekwondo, Sebastien Michaud and Ivett Gonda, also good competitors in taekwondo. See also, CBC’s video profile of Karine Sergerie. Please also see these articles on taekwondo at the olympics. I don’t know about the rest of Canada, but I’m looking forward to some exciting Olympic taekwondo matches. If Sergerie brings home the gold in taekwondo, perhaps Canada will finally pay some attention to this great martial art and sport, which blends grace and finesse with a true fighting spirit. Nate and I decided to do a (minimum) 20 km walk this year. Last year I did a walk/run down Yonge Street from Finch to Bloor, which was 12.6 km. This year’s walk (this past Saturday) was nearly double last year’s. We started our walk at Church St. and Weston Rd., then followed the discovery walk paths along the Humber River down to the lakeshore. 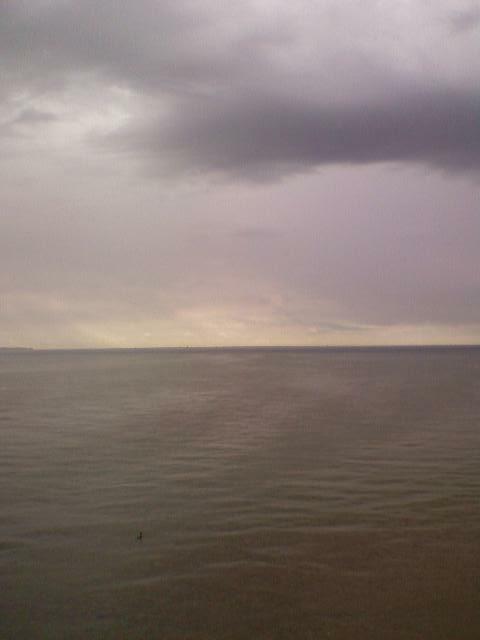 This brought us to the mouth of the Humber River, where it joins with Lake Ontario. 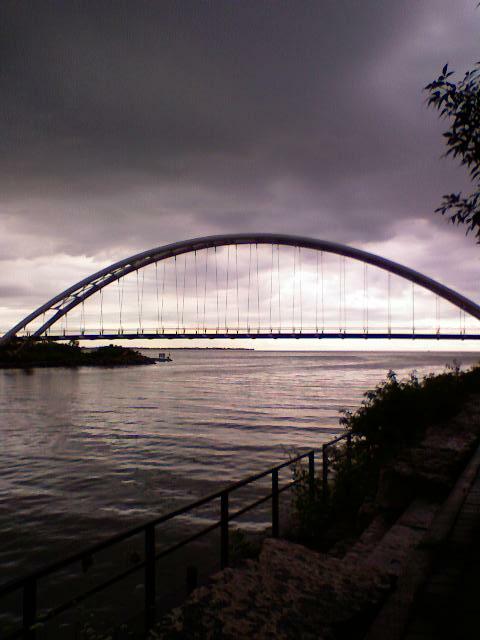 From there we crossed the Humber River bridge (see picture below), and walked east along the lakeshore to Union Station. The walk took just about five and a half hours. Halfway into the walk, it started to thunderstorm. I think it rained for almost two hours. Luckily, I was wearing a waterproof track jacket. Unfortunately, I had changed from my track pants to my shorts earlier because it was warming up. We weren’t expecting a thunderstorm that day, but well… I’m going to blame it on Nathan and that’s that. My legs were actually starting to get cold from the rain. By the time we were walking past Ontario Place, my good knee was starting to get cold and stiff. We walked on and the rain starting to ease up. Eventually, I found some shelter that turned out to be a washroom where I could freshen up and change back into my track pants. It wasn’t much after that that we reached lakeshore and Bathurst. From there, we could just walk along the Queen’s Quay to the Harbourfront and then to Union Station. I’m amused that the thunderstorm happened just as we were walking along the long stretch of lakeshore were it was more desolate. By the time we got to Bathurst, it was sunny and warm again. Go figure! All in all though, I was happy with the walk. My feet were a tad sore, but in actuality no more sore than when I used to do three hours of taekwondo training. I felt that good about the walk, I still went for a run the next day! You are currently browsing the Pneumatised! weblog archives for August, 2008.